Joined by leaders from across South Carolina, global consulting giant Capgemini cut the ribbon on its new Security Operations Center (SOC) in the BullStreet District in downtown Columbia, S.C. Capgemini is a $14 billion, international consulting, technology services and digital transformation leader with 200,000 employees in more than 40 countries worldwide, serving Fortune 100 and Fortune 500 clients in industries such as energy, financial services, telecommunications, consumer products and retail, manufacturing and more. At the ceremony held inside the SOC on Dec. 5, 2018, a crowd of dignitaries, community leaders, Capgemini leaders and employees gathered for remarks by University of South Carolina president Dr. Harris Pastides; Columbia Mayor Steve Benjamin; Capgemini North America Director of Communications Terri Hickey; and John Mullen, member of the Group Executive Committee and President of the North America Business Unit at Capgemini. Teresa Powers was on hand from the S.C. Department of Commerce to present a gift to Capgemini’s Mullen, with words of welcome to the firm from the State of South Carolina. The ribbon cutting marks an important milestone in Capgemini’s continued investment and expansion in Columbia. 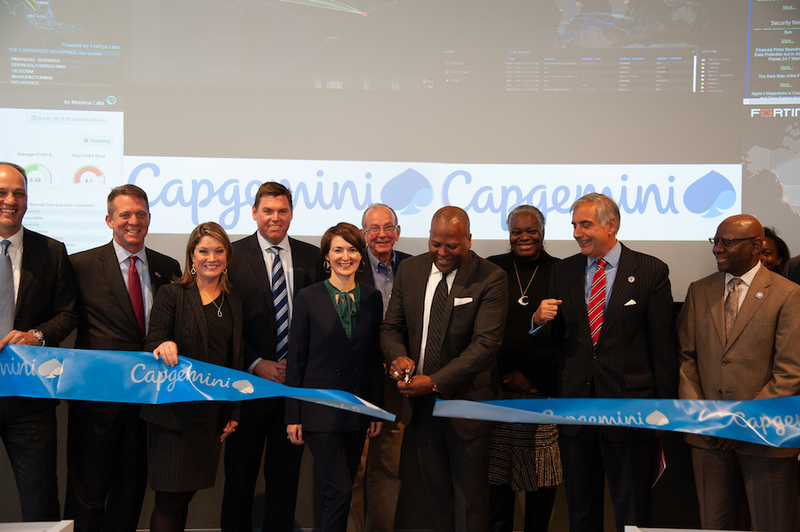 Capgemini opened a delivery center – the company’s first South Carolina office – in December 2017 when 125 employees moved into the third floor of 108,541-square-foot First Base Building. In August Capgemini expanded its operations in Columbia with the opening of an advanced technology and development center. Capgemini’s multi-million-dollar investment is projected to create hundreds of jobs in high-value and fast-growing technology areas including industry 4.0, digital strategy, cloud, artificial intelligence, cybersecurity, customer experience innovation and other emerging technologies – the largest announcement of tech jobs in Columbia, S.C., in 10 years. The SOC supports Capgemini’s commitment to building and shaping the workforce of the future, offering clients a broader set of capabilities to address the fast-growing areas of digital strategy, cloud, artificial intelligence, customer experience innovation and other emerging technologies. It also further strengthens the capabilities of its Columbia, S.C., center to help clients drive innovation, transformation and operational efficiency across their organizations while protecting data, assets, identities and overall customer trust. It is the tenth center of its kind in Capgemini’s global cybersecurity network of managed SOCs. Services offered through the SOC help companies integrate cybersecurity into broader growth initiatives and digital transformation efforts. End-to-end cybersecurity capabilities include security watch, vulnerability management, fraud monitoring, advanced threat detection, analytics, incident response, forensics, and governance risk management and compliance. Known as the largest urban redevelopment project on the East Coast, the BullStreet District is South Carolina’s first urban gigabit community and is built to attract talent. The offices feature comfortable, flexible work spaces, modular furnishings and floor-to-ceiling windows overlooking Spirit Communications Park, home of the Columbia Fireflies Minor League Baseball team. A global leader in consulting, technology services and digital transformation, Capgemini is at the forefront of innovation to address the entire breadth of clients’ opportunities in the evolving world of cloud, digital and platforms. Building on its strong 50-year heritage and deep industry-specific expertise, Capgemini enables organizations to realize their business ambitions through an array of services from strategy to operations. Capgemini is driven by the conviction that the business value of technology comes from and through people. It is a multicultural company of 200,000 team members in over 40 countries. The Group reported 2017 global revenues of EUR 12.8 billion (about $14.4 billion USD at 2017 average rate). Learn more at www.capgemini.com. People matter, results count. The BullStreet District is a 20-year, 181-acre project to transform the historic S.C. State Hospital site into a vibrant, mixed-use neighborhood district in downtown Columbia, S.C. The state’s first urban gigabit community, BullStreet is home to the award-winning Spirit Communications Park, where the Columbia Fireflies Minor League Baseball team has hosted more than 975,000 guests since launching in April 2016. Connected to the ballpark, the First Base Building is the largest private office building constructed in Columbia, S.C. since 2009 and is home to Ogletree Deakins law firm, global tech giant Capgemini, and Founders Federal Credit Union. Bone-In Barbeque restaurant opened in the historic Ensor Building in Spring 2018, and work is underway on the 196-unit Merrill Gardens senior living community. In August 2018, the first resident moved into one of 28 residential townhomes at TownPark at BullStreet. Historic preservation awards have been garnered by both the S.C. Dept. of Natural Resources’ Parker Annex Archaeology Center and the historic Bakery at BullStreet building, home to the SOCO cowork and event space, the hub of the BullStreet Technology Village. The Central Energy Facility is soon to transform into Central Energy, a special event venue and the new home of Downtown Church. A 20-acre public park with a dog park, trails, and pond is under construction, restoring 2,000 feet of natural habitat along Smith Branch Creek, helping to mitigate flooding downstream. BullStreet contains 125,000+ square feet of commercial/office and retail space and is zoned for up to 3.3 million square feet of commercial use and 3,553 residential units. Follow @BullStreetSC and #BullStreetSC on Twitter, Instagram and Facebook, and learn more at http://www.bullstreetsc.com.